On the way home from Annapolis, I had breakfast on my mind. Truth be told, I think breakfast on the weekend is one of my favorite meals. We also had to fuel up for the long road trip home. So, after consulting the GPS and a quick scan of the on-line reviews, we settled on a place called Eggspectation. As this was our retreat from Annapolis, this was the Ellicott City location in central Maryland. When you first walk in, there is a bakery case with sinful looking pastries, cakes, cupcakes, cookies, and cheesecakes. We were escorted to our table by a friendly hostess and were greeted by our serving team. After reviewing the menu, Eggspectation serves breakfast, lunch, and dinner. But, it is clear from the start, breakfast is their specialty. They have your standard eggs, bacon, potatoes, etc... But, my eye drifted to a section Benedict style eggs. The choices ranged from traditional to Southwestern, those with lobster or crab, and those with avocado. I love Eggs Benedict, but it is hard to find them done right. With 12 selections to choose from, I figured that they knew what they were doing. Since I was in Maryland and the weekend was about the crab, I choose the Crab Benedict. These perfectly poached eggs were served on sourdough English Muffins topped with Gruyere cheese, Hollandaise Sauce, and sautéed crab with a light dusting of Old Bay seasoning. The platter also came with a side of perfectly crisp Lyonnaise potatoes. For good measure, I ordered a side of cheesy grits. My only issue with this plate were the English Muffins. The could have been toasted a little longer so that the Gruyere would have been a little more melted. Other than that, this plate was perfect. 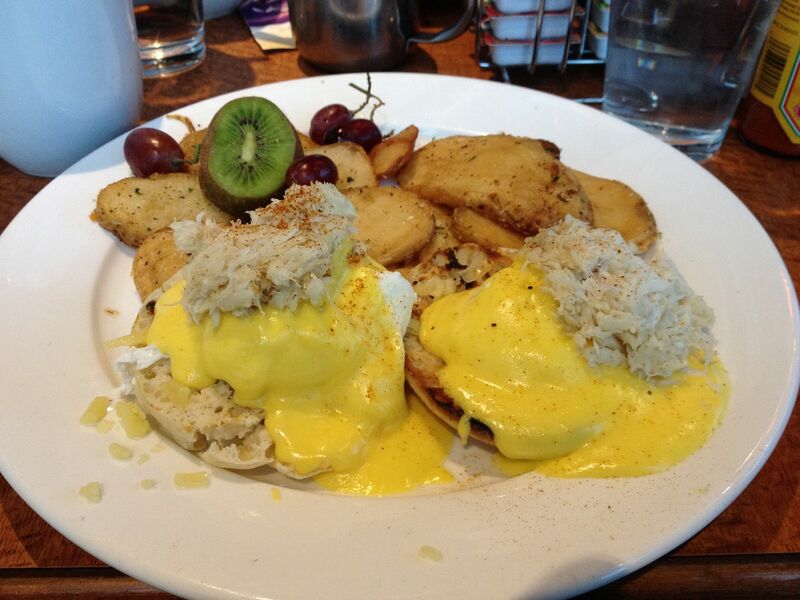 The Hollandaise was velvety and complemented the seasoned crab. Poaching eggs is an art form and the cooks at Eggspectation know their art. I did not get a picture of the grits, but there were outstanding. Creamy with a nice sharp cheddar taste. 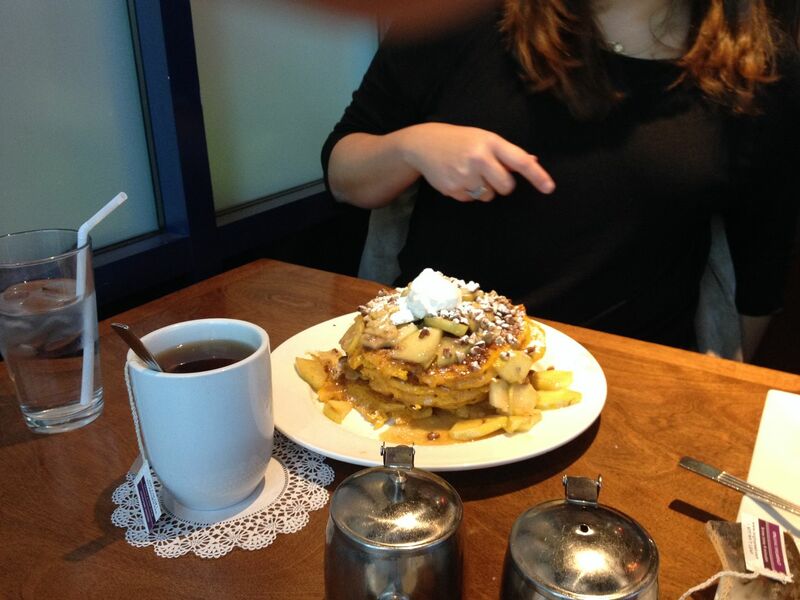 Our one friend ordered one of the breakfast specials, the Pumpkin Spice Pancakes. I like pumpkin, but I do not understand the pumpkin hype. Pumpkin mac and cheese? No thank you. But, I circled Heather's plate like a vulture, waiting to swoop in for a piece of the leftovers. These pancakes were topped with perfectly fried granny smith apples, raisins, walnuts, and a dollop of sour cream. When I finally picked my piece from the leftovers, I fell in love. The pumpkin was not overwhelming and the buttermilk base was a nice surprise. The fried apples alone would have been a perfect breakfast side, or a topping for some pork chops. Hope had the steak and eggs. The steak was of a higher quality that you would expect for breakfast. It was also cooked to the medium that was ordered. The seasoning was good as well. Eggspectation lived up to our expectations. We will put a return visit on our to do list the next time we have the opportunity. Grade = A-. Would have been higher except for the slightly limp English Muffins.